The beautiful city of Bergamo is located just a few miles from Bergamo airport and Bergamo Alta or (Citta Alta) is one place you simply must visit if you have time. 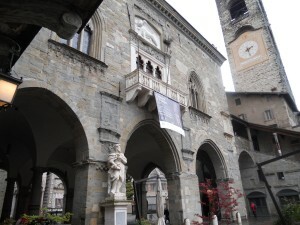 Bergamo Citta Alta is very easy to reach from Bergamo airport and the local bus that connects the city of Bergamo to the airport and only takes around 20 minutes. If you are flying into Bergamo Airport and have a connecting flight later the same day and are wondering how you are going to pass the many hours between flights, a visit to the Bergamo Citta Alta is a wonderful way to pass that time. If you are returning to Bergamo airport after a holiday and are flying back home on a late night flight, it is certainly worth allowing yourself a few hours beforehand to visit the city of Bergamo. The city of Bergamo is divided into 2 halves and these are the Upper part of the city known as ‘Citta Alta’ and the lower part of the city known as the ‘Citta Bassa’. The upper part of Bergamo is the old city and it is one of those places that until you have seen it for yourself, it is hard to imagine what it is really like. The lower part of the city ‘Citta Bassa’ is the modern and more commercial part of Bergamo. On a clear day you can see Bergamo Alta from the airport as it sits majestically on the hillside providing a lovely back drop to the airport. However, sadly many people just associate ‘Bergamo’ with the airport and only see the airport before continuing with the onward journey. Once they arrive at the airport they either catch the coach to Milan, jump in their hire car or get on the Bergamo bus and then catch the train to other towns and cities throughout Italy. As a result, they never even think to visit the old part of Bergamo, which ironically is probably one of the most historic small cities in Northern Italy and has some of the oldest buildings and churches in the region. All I can say is that if you don’t visit Bergamo Alta, you will miss out! A visit to Bergamo Alta really is a wonderful experience and a fantastic place to spend a couple of hours meandering through the winding cobble streets. Bergamo Alta is one of Northern Italy’s hidden gems and dates back to around 49 BC. The Upper City has so many historic buildings that still boast their original Medieval structures and architecture, you will be amazed! Bergamo Citta Alta is linked to the lower city by both road and Funicular. The experience starts when you get on the Funicular (you can catch the bus but I would definitely recommend the funicular) and begin to see the stunning views as you make your accent to the top of Bergamo Alta. The Funicular runs throughout the day from the station at Viale Vittorio Emanuele and is just €1.25 (at the time of writing). On a clear day you can see for miles across Bergamo and then further afield over the Lombardy region. As you climb higher you can see the large towering city walls that once protected the city from invading armies. The ride up the Funicular does not take long (only a couple of minutes) but it certainly adds to the experience as it begins to set you back in time. Once you reach the Funicular station at the top and walk through the exit doors into the street (Piazza Mercato delle Scarpe), it is like stepping into another world. It is like climbing the Beanstalk and entering the Giants kingdom! I know this might sound strange but it is surreal to think that this world is going on day after day away from the modern world below yet nobody really knows about it. So Why Is Bergamo Alta So Special? Once you begin to walk through the streets of Bergamo Alta, it’s not hard to understand why this Upper city is such a special place in the history of Northern Italy. If ever there was a small city that transports you back in time, Bergamo Alta certainly is high up there with the best of them. The delightful Cobbled streets, atmospheric cafes bars, restaurants, bakeries, beautiful churches and Medieval architecture that surround the stunning Plaza all add to the unique charm and character of the Bergamo Citta Alta. This open air museum of buildings and life dating back hundreds of years is maybe one of the most well preserved exhibits you will see in any one small area. Today, the city has very little traffic as it is kept to a minimum and only a few local residents actual drive through the streets. You have several choices with regards to directions once you exit the Funicular station but one of the more popular routes is to walk along the Via Gombito (which is the street to your right) and then to the Piazza Vecchia. Along the Via Gombito there are a selection of shops, bars and restaurants for you to browse on your way. One of the centre pieces of the Piazza Vecchia is the ‘Contarini’ fountain and this fountain was donated to the city by the Venetian Governor ‘Alvise Contarini’ in 1780. Alvise Contarini wanted to donate the fountain to the city before he returned home to Venice. The donation was a gesture of friendship to show the strong relationship between Venice and the people of Bergamo city. The first inhabitants of Bergamo City were the Celts, Goths, Romans and Longobards. The Citta Alta was built in the 17th century and was built on the hill with a large Venetian fortress wall to protect the city. The Fortress was built by the Serenissima Republic of Venice during the latter part of the 16th Century and took approximately 30 years to build. The old city was under Venetian rule from the 15th Century to the 18th Century and the architecture of the buildings in the city surely reflects the Venetian dominance. This can be seen on one of the Civic buildings in the Piazza Vechia (Main Square) which displays the shield Lion of St. Mark, which is a symbol of Venice. The city was guarded by several strategically located lookout towers that were situated at various points around the city walls and hillside. Some of the remains of these lookout towers can still be found and the central hub of the lookout system, was at the castle built on the hill ‘San Vigilio’. Signals to warn of invasion would then be relayed along the lookout system by the use of mirrors or fire. These lookout towers provided the perfect vantage points across the river Brembo, the roads between the two rivers Brembo and Adda, San Martino Valley and could inform the city of any advancing troops. you cannot help but be impressed with the square and its surroundings. The square has often been referred to as one of the most beautiful squares in Europe. As I mentioned previously, the backdrop is unbelievable with the Palazzo della Ragione and Campanone taking centre stage. There are now several restaurants that are situated around the Piazza Vechia and it is a lovely place to stop and have a drink or something to eat while soaking up the wonderful view. Piazza Duomo (Cathedral Square): The Piazza Duomo is a smaller square that is located underneath the Palazzo della Ragione and beneath the shadow of the Cathedral. Basilica di S.Maria Maggiore: Regarded as one of the most historic building in the old city of Bergamo, the Basilica di S.Maria Maggiore was once held for batisms and used for a hall for Civic Assemblies. The Basilica di S.Maria Maggiore is built on the same site as a much smaller church the ‘Santa Maria’ and work began building it in 1137. Palazzo della Ragione (Palace of Reason): This was once the seat of the Administration of the old city or the ‘Town Hall’ of Bergamo but it now houses paintings from the Accademia Carrara. The Palazzo della Ragione dates as far back to the 12th Century, it was later rebuilt in the 16th Century by Pietro Isabello. known as the Suardi family and was later used by the Municipality of Bergamo. The tower has a large bell inside and the chiming of the bell was used to inform the local people of advancing enemies, fires and meetings. The city used to have a curfew and at 10pm every night, the bell would chime to let people know that the gates of the city would be locked. Even to this day, the bell chimes 180 times each night to keep tradition. There is a glass lift that visitor can take to reach the top of the tower that provides magnificent views over the city. Palazzo del Podestà: For centuries this was the home of the Venetian Governor and Governors of Bergamo. However, it was origally the home to the powerful Suardi/Colleoni families. The Castello di San Vigilio: These are the ruins of the castle that was fortified in the 6th Century. Although the castle is no longer standing, the round base and side walls are still visible. Cittadella (Citadel): Built by the Visconti in the mid-14th century. Palazzo della Ragione: The Palazzo della Ragione now houses a range of paintings from the Accademia Carrara but it was originally the seat of the Administration of the city of Bergamo. Palazzo Nuovo: The Palazzo Nuovo is the new Palace designed by Vincenzo Scamozzi in the 17th Century and is located at the Northern end of the Piazza Vechia. It faces the Palazzo della Ragione and is now the current Headquarters of the Civic Library. Basilica di Santa Maria Maggiore: The Church was built in 1137 and the building continued for over 200 years. The Basilica di Santa Maria Maggiore is regarded as one of the finest buildings in the whole of the Lombardy region and when you enter the building, it is not hard to see why. It is located behind the Palazzo della Ragione and next to the Duomo. Biblioteca Civica Angelo Mai (The Civil Library of Angelo Mai): This is the oldest library in Bergamo and houses a large number of Scrolls and Manuscripts. The library itself is housed inside the Palazzo Nuovo. built between 1471 & 1475. Bergamo Cathedral (Duomo): Building began in 1459 and changes were made as late as the 19th Century. Originally there had been two cathedrals in Bergamo the Basilica of Saint Alexander and then Basilica of Saint Vincent. However, there is only one that still remains today. Churches In Bergamo Alta: San Michele al Pozzo Bianco – Sant’Agostino are the main churches in Bergamo Alta. Piazza Del Duomo – Cathedral Square: This is a smaller square situated underneath the Palazzo della Ragione and here you can find the ‘Cathedral Santa Maria Maggiore’ which is home to the famous Cappella Colleoni. Palazzo della Misericordia: This is the building that houses the museum of the musician Gaetano Donizetti who was from Bergamo. The museum displays such items as books, relics, letters, autograph music scores and portraits. Donizetti Museum: This museum is housed in the Palazzo della Misericordia and is dedicated to the life and works of the Bergamo composer and Musician Gaetano Donizetti. Gaetano Donizetti composed 70 Operas throughout his life and is said to have been an inspiration for many other Italian composer such as Puccini and Verdi. The museum displays many of Gaetano Donizetti scores as well as personal items and portraits. Monastery of Santa Grata: This is a Monastery that was once the home to Benedictine Nuns but is not actually open to the public. Torre Della Campanella: The Torre Della Campanella or ‘Tower of the small bell’ was first built in the 13th Century and then restored in the 19th Century. The Torre Della Campanella has a walk through underneath that leads you into the Piazza Mascheroni and into the Cittadella. If you have time, the city of Bergamo is a wonderful place to spend a few hours. The old city ‘Bergamo Alta’, is definitely worth a visit and is one of the unknown gems of Northern Italy.